Clinical Respect is our health provider promise to deliver excellence in patient care while helping achieve best value in prescribing. Current government policies focus on increasing efficiencies in the NHS, and as new drugs and treatments become available it is important that the NHS makes the most of their funds and resources. 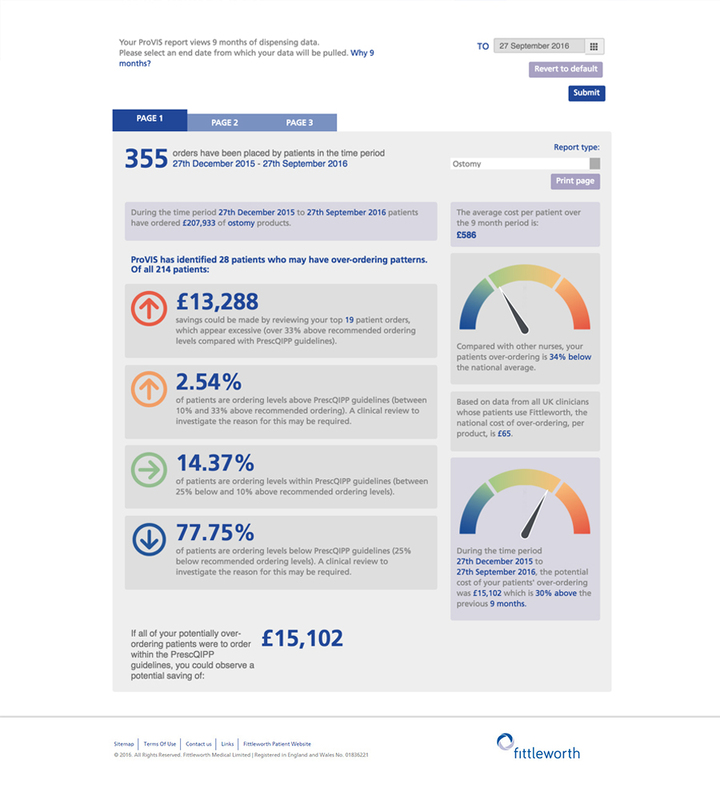 Ostomy, urology, continence and wound care are just some areas where prescribing efficiencies can be improved using individual and collective patient data. 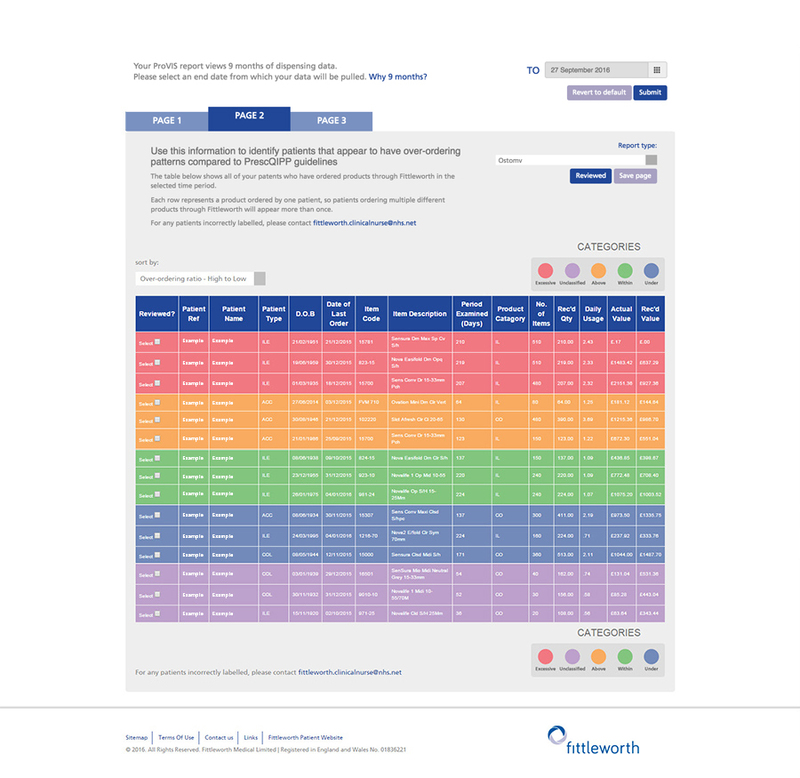 Fittleworth understands the cost pressures on the NHS and, as part of our Clinical Respect values, we have created ProVIS. ProVIS is a free, online, patient dispensing data management tool that enables health providers to track their Fittleworth patients’ prescribing spend for products and appliances across the market. Available for nurses and commissioners across ostomy and urology products, it gathers dispensing data for patients who have selected Fittleworth as their Dispensing Appliance Contractor (DAC), and presents it in a way that makes it easy and straightforward for you to identify and control product use and dispensing costs. 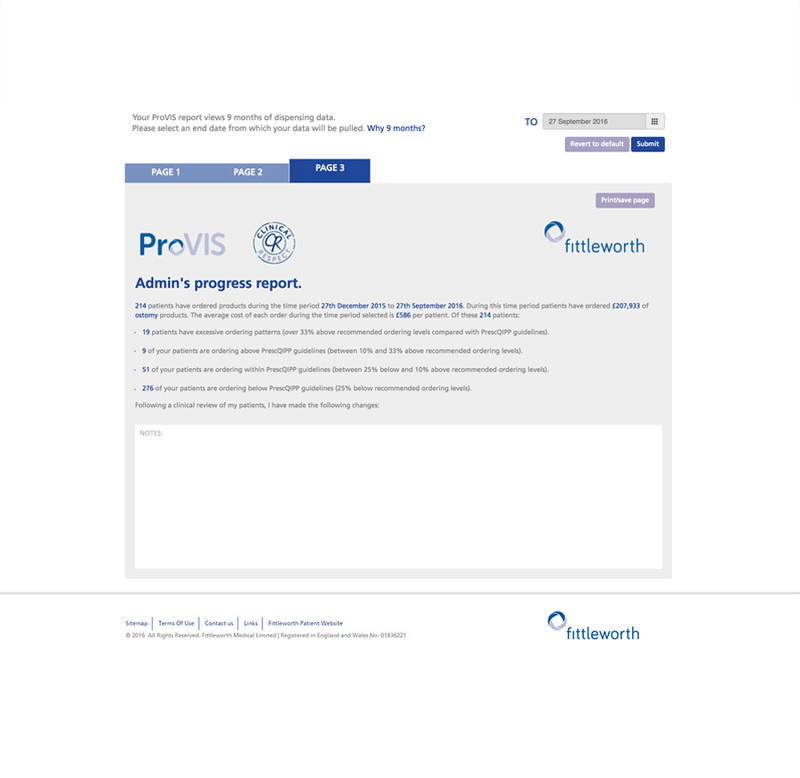 For more information about ProVIS and to register for your new ProVIS online reports click here. Combining our innovative and award winning home delivery service with Clinical Respect and ProVIS, our aim is to work alongside specialist nurses to transform patient care and management. *we take patient confidentiality very seriously. Fittleworth aims to ensure the utmost security for patient data and has taken extra precautions to ensure that confidential patient data stays confidential. Patient care is at the heart of everything we do and we pride ourselves on delivering a friendly and informative service to our customers. Fittleworth is the founding member of the World Assist Alliance; an international network of delivery companies just like ours. Each member has signed up to a promise that, should patients have any problems with their products while abroad, they will provide emergency supplies of appliances and, in most locations, specialist nursing advice if required. World Assist Alliance offers patients and healthcare professionals reassurance that Fittleworth is dedicated to the delivery of stoma and continence products to the customers. World Assist Alliance is available to Fittleworth customers who have placed a minimum of three or more prescriptions with us in a twelve-month period. Maintaining our promise to prescribers means you can be confident that your patients are receiving the products that you prescribe, without any costly additional appliances, making your service both efficient and cost-effective. Fittleworth has 38 Care Centres nationwide providing a local, personal service. Having multiple independent Care Centres ensures excellent stock availability, across all major manufacturers, so you and your patients can rely on us to provide the products they are prescribed. Most of our centres have their own dedicated team of local delivery drivers who provide a personal and discreet service to those who need it. Local knowledge ensures drivers know the neighbourhood and traffic hot-spots as well as the particular needs of their customers. With drivers having been with Fittleworth for many years, they know the best time to call, where to leave parcels when customers are out and are always a welcome and friendly face, willing to help. For those who do not require a delivery service, our Care Centres are open from 9am to 5pm Monday to Friday for the personal dispensing of prescriptions, with the exception of Islington which is currently open until 5.30pm. Fittleworth is simply a home delivery service, which is not influenced by any manufacturer. Our independence combined with our Clinical Respect values means we do not amend, substitute or add anything to a patient’s prescription unless prior approval has been received from the health provider responsible, so you can rely on us to ensure your patients receive exactly what you have prescribed. However, our independence goes above and beyond prescribing – we are independent in the way we think, independent in the way we approach our customers and independent in the services we offer – which makes us truly the dispenser of choice. Following the publication of an approved Customer Satisfaction survey format for Dispensing Appliance Contractors (DACs) in October 2010, Fittleworth Medical Ltd has carried out surveys of its customers that use products dispensed from Fittleworth Care Centres. The survey results can be accessed here. CQC registration aims to ensure that only those deemed able to provide, and manage, good quality care are authorised to do so, setting a reassuring benchmark across the healthcare sector. Information Governance is all about how organisations ‘process’ or handle information covering both personal and corporate information. It is a reputable measure of a company’s compliance with the law. Fittleworth has retained its level three status and achieved a 100% satisfaction score – a vital part of our Clinical Respect promise. It demonstrates that, unlike many DACs, we are fully committed to complying with all governance issues and that we are a partner that can be trusted with the security of patient data.